The Green Rush is alive and well. 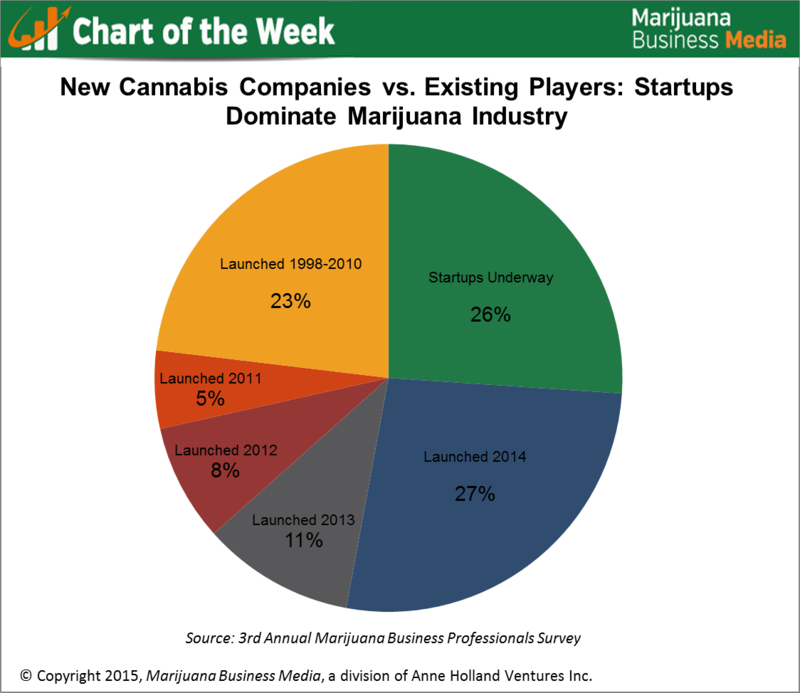 Roughly 53% of cannabis-related businesses either launched in 2014 or are in startup mode now, underscoring intense entrepreneurial interest in the industry, according to preliminary data from Marijuana Business Media’s recent survey of executives in the sector. This represents a slight uptick from early 2014, when 51% of respondents were forming a startup or had just launched the previous year. Marijuana Business Media, the parent company of Marijuana Business Daily, conducted the online survey between Jan. 22 and 29. For preliminary results, the responses of 779 executives at dispensaries, retail stores, cultivation operations, infused products companies and ancillary firms were analyzed. The state-legal marijuana industry has been around in one form or another since the late 1990s, when the first licensed dispensary opened in California. But just 23% of survey respondents launched their cannabis businesses before 2011. Only 13% of respondents said their companies were founded in 2011 or 2012, highlighting the impact of a federal crackdown on cannabis and huge concerns over the industry’s future at the time. Startup activity slowed noticeably those years, and many businesses (including more than 500 dispensaries) closed their doors. In the past two years though, eight states (including Washington DC) have legalized recreational or medical cannabis, while other new markets have come online – boosting business opportunities. This startup fervor is similar to the dot-com days, when entrepreneurs and professionals from all industries flocked to start Internet companies. Although startups dominate the cannabis space in terms of the sheer number of companies, older players operate some of the biggest businesses in their respective niches, as one would expect. Still, it’s a new enough industry that no one can predict which companies will be industry leaders five years from now. With so many newbies coming in, companies that provide products and services to the industry – ranging from accountants to lawyers – can’t rest on their laurels. Even if you were the best-known brand in the business community for years, new competitors could gain traction quickly. And this could just be the tip of the iceberg. Startup activity will likely accelerate quickly as more states legalize medical and recreational marijuana, and any change in laws at the federal level could open the floodgates. Obviously some businesses will falter early on, while others will never grow very big. But there is a chance that a company just starting up now will someday be a household name. Medical and Recreational not the same. My grandmother used alcohol infused to help her pain in her legs. I was 13 then and I am going to be 55 tomorrow. most of these businesses are not manufacturing or sells cannabis. most of these start ups are support structure companies ie, packaging, web design. We need these businesses but, just because you cater to the cannabis industry does not make you a marijuana business.